Dolly history Fifty years ago Tuesday, Porter & Dolly record “Always, Always;” released as a single two months later, it peaks at No. 16. Twenty-five years ago Tuesday, Dolly begins a series of concerts at Dollywood (that conclude the following day) which are compiled into her second live album, Heartsongs: Live From Home; released six months later, it reaches No. 16 country, No. 87 pop. Thirty-seven years ago Wednesday, Heartbreak Express debuts on the album charts; it peaks at No. 5 country, No. 106 pop. Forty-nine years ago Thursday, Dolly Parton Day is held in Sevierville, Tenn., culminating in the recording of A Real Live Dolly, her first concert album, in her high school gymnasium; released four months later, it peaks at No. 32 country, No. 154 pop; although cut from the album, the concert features her first public performance of the autobiographical song “Coat Of Many Colors,” regarded as her personal favorite of all songs she's written (it is included as a bonus track on the 2003 CD re-issue of Just Because I'm A Woman). Forty-eight years ago Saturday, just over a year to the day of its first performance, Dolly records “Coat of Many Colors;” released as a single six months later, it reaches No. 4 and becomes second only to “I Will Always Love You” as the song most identified with her throughout her career. Forty-seven years ago Sunday, Porter & Dolly record “We Found It;” released as a single 11 months later, it reaches No. 30. Forty-one years ago Sunday, Here You Come Again is certified as the first of Dolly's six platinum albums for sales in excess of 1 million copies each. Eighteen years ago Sunday, Dolly headlines the 14th annual MerleFest music festival at Wilkes Community College in Wilkesboro, N.C., bringing in a record crowd of more than 77,000 to the festival. Dream More: Celebrate The Dreamer In You paperback edition of Dolly's book Nov. 512:30 a.m.
Les Grands Espaces, Isabelle Boulay, Nov. 15, duet on "True Blue"
The Complete Trio Collection Deluxe by Dolly, Emmylou Harris and Linda Ronstadt holds steady at No. 5 on the British country compilation albums chart in its 136th chart week, it was revealed Friday. Also on the U.K. country compilation albums chart, Harris's Original Album Series: Volume 1 (with two Dolly covers, one track with Dolly harmony and one track with Trio harmony by Dolly and Ronstadt) dips three to No. 9, while her Original Album Series, Volume 2 (featuring one track with Dolly harmony and two tracks with Trio harmony by Dolly and Linda Ronstadt) rises three to No. 13 and Ronstadt's Original Album Series (featuring one Dolly cover and one track with Dolly harmony) and The Essential Dolly Parton both fall out of the top 20, down from No. 17 and No. 20, respectively. Down Under, the "gold series" re-issue of The Very Best Of Dolly Parton (Australian Tour Edition) holds steady at No. 16 in its 396th chart week on the Australian country albums chart since its original 2007 release, it was revealed Saturday. Could Dolly play a presidential inauguration? Of course, several candidates in recent years have used her classic “9 To 5” on the campaign trail (both Hillary Clinton and Sarah Palin in 2008 and Elizabeth Warren in the current presidential race) and Trump danced to the song at one of his inaugural balls, but Dolly herself shies away from anything political. Chasten Buttigieg tweeted that his husband and presidential candidate Pete Buttigieg's statement to TMZ that he'd like Phish to play at his inauguration if elected showed their difference in musical opinions. The potential First Gentleman said his dream performers for an inauguration would be Beyonce, Jimmy Buffet and Dolly, according to The Indianapolis Star here. Dolly's Pigeon Forge location of her Pirates Voyage dinner theatre is getting closer to opening, and the pirate ships arrived last week. Read more from WBIR here. Retailers on Thursday night began showing the 1975 Porter Wagoner and Dolly album Say Forever You'll Be Mine available this Friday for downloads, making the duo's 1980 lawsuit settlement album of older unreleased cuts, Porter & Dolly, their only RCA studio recordings not presently available for download (although eight of its 10 tracks were released recently on the rare recordings collection The RCA Sessions (1968-1976) and the other two are available on some other compilations, so some may consider that album technically available as well) in addition to two unavailable solo Dolly RCA albums, Bubbling Over and In The Good Old Days. Music City's NFL team, the Tennessee Titans, this week released their schedule for the 2019 season and had several country music artists introduce each opposing team on the list, which concludes with Dolly encouraging fans to "Titan Up!" Watch the video here! South African drum group Drumstruck recently returned home at the end of Dollywood's Festival of Nations, garnering several stories in the local media about their performances in the U.S. including one from satellite channel ENCA here. Thanks to Chuck for alerting me that Taste Of Country put Dolly's Little Sparrow at No. 69 of the top 100 best country albums of the 2000s, also placing Brad Paisley's Time Well Wasted (which features his "When I Get Where I'm Going" duet with Dolly) at No. 25. See the entire list here. Although Dolly won't be returning to her former Dolly Parade in Pigeon Forge this year, now called the Music In The Mountains Spring Parade, another big-mouthed southern broad will be making an appearance. The city announced this week that Paula Deen, who operates a restaurant in Pigeon Forge, will join Hal Ripken Jr., who replaced Dolly as grand marshal last year after 30 years, as co-grand marshal this year. Read more from The Knoxville News-Sentinel here. Dolly's personal dress designer, Robert Behar, will be offering a Master Style Class in Los Angeles next week where he'll talk about the inspiration behind several of his iconic creations for Dolly, Mariah Carey, Janet Jackson, and Naomi Campbell, among others, he revealed on his Instagram here. The lecture takes place at 3 p.m. Sunday, April 28, at the Guild Theatre in Hudson Theatre, Tickets may be purchased from Robertbeharevents@gmail.com. Musical theatre legend Christine Baranski apparently will appear in Dolly's Netflix holiday special, she told Page Six's Cindy Adams at this year's Hollywood Reporter party. Adams quoted her here saying: "I'm doing a Dolly Parton Christmas special for Netflix. Just we two together. I think I'm the Grinch." Not much else has been released about Christmas On The Square other than that Dolly wrote all of the music for it. Recently, the network was casting for dancers to appear in the film, which will shoot in the Atlanta area. Dolly was in a studio Monday taping an interview for an upcoming documentary on Kenny Rogers, Nashville's Boardwalk Productions revealed on Instagram. Thanks, Chuck! The "gold series" re-issue of The Very Best Of Dolly Parton (Australian Tour Edition) regains one to No. 16 in its 395th chart week on the Australian country albums chart since its original 2007 release, it was revealed Saturday. Dollywood on Saturday was presented with the Themed Entertainment Association's (TEA) highest honor, the Thea Classic Award, at the 25th annual Thea Awards Gala in Anaheim, Calif. Although Dolly could not be present, she sent an acceptance speech via video, and the park's president Craig Ross accepted the honor in person, according to Theme Park Insider here. Dolly's classic "9 To 5" played a prominent role in Thursday night's episode of the science fiction comedy/drama series The Orville on FOX. In one of the series' more serious episodes, the ship discovers a colony of women on a hidden planet from a society that finds females disgusting and forces all children born as girls to have gender reassignment surgery to become male. Those who disagree with the practice have developed an underground railroad to ferry girls prior to any surgery to this settlement where they are raised to become women instead of men. With their discovery, the ship's captain suggests petitioning the Union of planets for recognition as an independent member so that the residents are not arrested and taken back to their home planet for forced surgery and imprisonment. On the ship to Earth, she asks if the captain's planet lets women express themselves. He gives her access to the database of female artists and she randomly selects "9 To 5." As it plays, she is spellbound, exclaiming Dolly is singing with the voice of a hundred warriors and will be the voice of their revolution. When she addresses the Union to make her case, she quotes the lyrics of the song as coming from one of Earth's great poets. When her home planet chooses to attack the colony and the ship's crew steps in to protect them, the ground phaser battle and space battle were choreographed to "9 To 5" (similar to the opening scene of Deadpool 2). And when the issue is resolved and the women are safe, their leader asks the captain, "Do you think Dolly Parton would be proud of us?" He answers, "Yes, I think she would." The gag shows the genius of show creator Seth McFarlane's comedy. His best humor comes from a place of truth and irony. An obvious Dolly fan given his use of several of her songs in his other shows in the past (most notably on American Dad), he is likely aware that she is held in high regard by serious music critics as one of the greatest songwriters of all time, but her image as perceived by the general public not aware of her vast catalog is not that of a poet but a big-boobed late night talk show joke, so when the character finds inspiration in her labor anthem and calls her one of the planet's greatest poets, the dialogue is designed to elicit laughter from most of the audience, unaware that the lines are truthful and that – as Dolly is fond of saying – the joke is on them. Broadway's Ben Platt last week appeared on The Late Late Show With James Corden for a "Soundtrack To A Bromance" performance telling the story of two friends over the course of their lives. Among the songs performed was Dolly's "9 To 5," which the Facebook feed of the West End version of Dolly's musical based on the film shared this week. Check out the clip here. The Complete Trio Collection Deluxe by Dolly, Emmylou Harris and Linda Ronstadt holds steady at No. 5 on the British country compilation albums chart in its 135th chart week, it was revealed Friday. Also on the U.K. country compilation albums chart, Harris's Original Album Series: Volume 1 (with two Dolly covers, one track with Dolly harmony and one track with Trio harmony by Dolly and Ronstadt) rises three to No. 6, while her Original Album Series, Volume 2 (featuring one track with Dolly harmony and two tracks with Trio harmony by Dolly and Linda Ronstadt) gains one to No. 16 and Ronstadt's Original Album Series (featuring one Dolly cover and one track with Dolly harmony) inches down one to No. 17. The Essential Dolly Parton slips one to No. 20. The NFL Draft will take place in Nashville this year, and the city's team, the Titans, announced on Wednesday that the NFL Network has tapped Dolly to record the voice over introduction for the channel's special three-day coverage April 25-27 under the theme "A Star Is Born." Learn more here. With the recent induction of Stevie Nicks, The Houston Press opined Wednesday on 15 other women who should be in the Rock N Roll Hall Of Fame, including two country icons, Dolly and pal Loretta Lynn. Read their reasons here. Rolling Stone on Tuesday chose an obscure Porter & Dolly reference for its flashback segment on its website, looking at the 50th anniversary of Porter Wagoner recording the first unreleased version of Dolly's classic "Coat Of Many Colors." They also dug up and shared a video of the recording someone obtained and posted eight years ago to YouTube, featuring Porter's lead vocals and Dolly's on harmony leading the usual RCA background singers. (That version, however, is unlikely the April 9 recording, since RCA's masters notes list that version as "rejected," and the rejected tracks were usually destroyed. Instead, it's most likely the second version that Porter recorded of the song six days later on April 15, which RCA's masters notes list as simply "unreleased." I have no idea where the YouTube poster obtained the recording, since it has not been released on any compilation to my knowledge. He did record it again in 1982 and release it on his album One For The Road, but that is a different version than this one.) Porter's recording came a little more than a month before Dolly recorded the song for an unreleased track, a year before she performed it at her live album recording at her high school (although that version wasn't released until the album was re-issued on CD), and two years before she recorded the actual version that was used as the single and title track to the album of the same name. Read Rolling Stone's story here and take a listen to the recording here or in the media player above. An interview with Dolly recorded during her recent stop in London to open the West End production of 9 To 5: The Musical aired Tuesday night on BBC Radio Scotland. Take a listen to Another Country With Ricky Ross here. The first hour features classic Dolly songs and covers, while the second hour features an interview focused mostly on her songwriting and interspersed with songs being played. Critics for Britain's The Independent were asked recently to list the greatest concerts they have ever attended to compile a list of modern music's 18 best performances ever, and Dolly's 1983 stop at London's Dominion Theatre to film an HBO special was included here. The reviewer revealed he remained after the main concert after its posh audience of paid attendees left and about half an hour later a large group of punks and goths were brought in and Dolly provided them an "impromptu extra set, which was full of risqué jokes and blue banter." The reactions of the young audience members were filmed and then inserted into the footage of the real audience from the filmed concert earlier in the evening to give the impression that the audience was more diverse and younger than it actually was. PBS documentarian Ken Burns spoke with West Virginia Public Radio about his upcoming Country Music project here and gave much praise to Dolly, who participates in the project. At one point, he calls her one of the genre's all-time greatest songwriters and notes the simplicity of the lyrics to "I Will Always Love You" but the complexity she gives the song in performance. He also said the first episode includes a look at how multiple generations took "Mule Skinner Blues" and made it their own, from the original Jimmy Rodgers recording in 1930 through Dolly's 1970 version. Former Tonight Show intern and current RuPaul's Drag Race judge Ross Matthews enjoyed a day at Dollywood this week and shared some of the images on Facebook here. He promises to talk about the trip on his Straight Talk podcast here. K-Pop group BTS this week released several clips of footage from their experience at this year's Grammy Awards, including one of member Jungkook being moved to literal tears during Dolly's tribute segment as she was performing "After The Goldrush." Check it out via Twitter here. Did Maren Morris Steal '9 To 5' Melody For New Song? Did newcomer Maren Morris steal from Dolly? After she and The Brothers Osborne performed their new song, "All My Favorite People," on last weekend's ACM Awards, many observed that the tune (credited as being written by Morris with her husband Ryan Hurd and Mikey Reaves) bore a striking resemblance to the melody of Dolly's classic "9 To 5." Buffalo, N.Y., radio station WYRK noted the "déjà vu" here, while Go Buz opined here that the song "lifts its melody from Dolly Parton's '9 To 5.'" Even Slate said in its review of her new album here that "the verse's cadences are a clone of" Dolly's song and wondered if Morris copied it as "inadvertent pilfer or deliberate homage." In related news, KXXV in Waco, Texas, shared their creative services director's tribute to Dolly with a "9 to 5" music video staring her pet chicken, Nugget. Watch it here. With its 30th anniversary just around the corner, sentimentality is setting in for Steel Magnolias, including a new interview with playwright Robert Harling where he recalled the excellent cast here with Closer Weekly. As Dollymania.net reported back in January, the film is returning to select theatres in May for the anniversary. Tickets are on sale for May 19, 21, and 22 in 500 cinemas across the country via Fathom's website here. Dolly's NASCAR debut was a strong one, as her face on the hood of Tyler Reddick's No. 2 Camaro led the race for most of the day at Bristol Motor Speedway but lost the lead and came in second in the overall race. The Associated Press offered a story about the car she sponsored with her business interests covering it, available via ABC News here, and check out her videotaped message to the team, which FS1 aired during the first section of the race, here via Facebook or in the media player above. The "gold series" re-issue of The Very Best Of Dolly Parton (Australian Tour Edition) loses four to No. 17 in its 394th chart week on the Australian country albums chart since its original 2007 release, it was revealed Saturday. According to Knoxville television station WVLT here, the deadline to submit audition recordings for the annual Dolly-composed song singing competition in her hometown, Sevierville's Mountain Soul Vocal Competition at the Bloomin' BBQ and Bluegrass Festival May 18, has been postponed a week. Originally due with an April 5 postmark, the deadline to mail an audition recording has been extended to Friday, April 12. Now in its 15th year, winners of the competition receive cash prizes and entry fees are $10 for the 13-and-up category and $5 for the 12-and-under category. The entry form and rules are available here. 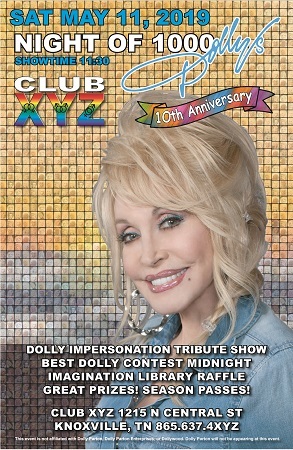 Contestants must perform a song composed by Dolly, regardless of whether she performed it or not, and organizers encourage contestants to visit Dollymania.net's list of her songs here to determine if their selection was written by Dolly or not. BPI (The British Phonographic Industry) on Friday announced two Dolly recordings had reached new certification levels last week. On March 29, the single "Jolene" was certified platinum for sales in excess of 600,000 since its digital release in 2004 (it had previously been certified gold in the U.K. in 2017 for 400,000 units and silver in 2014 for 200,000), and the 2013 compilation The Real Dolly Parton was certified gold for sales in excess of 100,000 (after going silver for sales of 60,000 in January 2018). 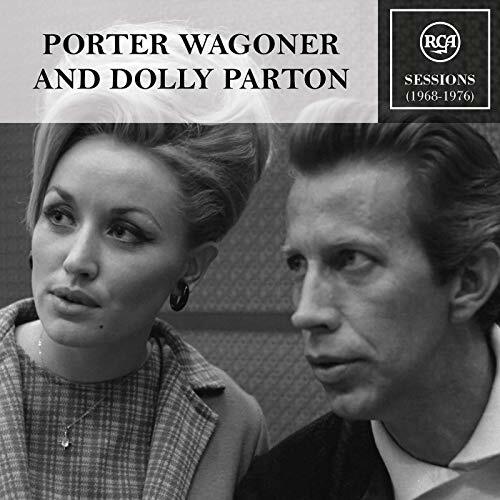 Sony Music on Friday issued a new Porter & Dolly compilation featuring almost all of the rare and previously-unreleased tracks that first saw the light of day in the German label Bear Family Records 2014 boxed set Dolly Parton & Porter Wagoner: Just Between You And Me, Complete Recordings 1967-1976. Since fall 2018, the label has been releasing the classic Porter & Dolly duet albums for the first time ever on digital download. This week, instead of releasing one of the two albums currently unavailable (1980's Porter & Dolly and 1976's Say Forever You'll Be Mine), the label put out a new compilation of 22 rare tracks. The RCA Sessions (1968-1976) contains seven of the nine tracks that were first released on the complete recordings boxed set (missing for some reason are 1971's "Waldo The Weirdo" and 1976's "Golden Streets of Glory"), a 1969 track that was first released on a 2012 compilation, four alternate recordings of previously-released songs that were first released on the boxed set, their 1973 charity single duet "Here Comes The Freedom Train" and its B-side Porter solo "All Aboard America" (which on the boxed set was remastered from your webmaster's 45 single in my personal collection), and eight of the 10 songs that were overdubbed and remixed for their final album, 1980's Porter & Dolly (missing are the album's two singles, "If You Go, I'll Follow You" and "Making Plans") – which were the original, non-overdubbed versions on the boxed set and presumably also on this collection. Download the collection here! The Complete Trio Collection Deluxe by Dolly, Emmylou Harris and Linda Ronstadt dips one to No. 5 on the British country compilation albums chart in its 134th chart week, it was revealed Friday. Also on the U.K. country compilation albums chart, Harris's Original Album Series: Volume 1 (with two Dolly covers, one track with Dolly harmony and one track with Trio harmony by Dolly and Ronstadt) rises six to No. 9, while her Original Album Series, Volume 2 (featuring one track with Dolly harmony and two tracks with Trio harmony by Dolly and Linda Ronstadt) loses six to No. 17 and Ronstadt's Original Album Series (featuring one Dolly cover and one track with Dolly harmony) moves down two to No. 16. The Essential Dolly Parton re-enters the top 20 at No. 19. The Dolly art exhibit previously reported on here a few weeks back opened on Friday in Knoxville at the Rala gallery, WVLT reported here. Lionel Racing, the official die cast maker for NASCAR, confirmed on Thursday that a model of Dolly's No. 2 Camaro which will debut at the Bristol Motor Speedway on Saturday will be forthcoming. Although a date for release has not been announced, a spokesperson told Dollymania.net: "Yes we do plan to offer this die-cast. We'll post it on our web site and here on Facebook when we're approved to do so, so stay tuned!" Thanks to a reader who alerted me that Dollywood is soliciting input from the park's youngest visitors for a new "Dear Dolly" segment. Children are encouraged to submit written or video questions about the park, observations or suggestions via e-mail and Dolly will address selected ones in an upcoming video series. Example questions included: "Dear Dolly, can you make a ride where I get to be invisible? Dear Dolly, I don't like that they serve vegetables in the restaurant. Dear Dolly, why don't you have more ice cream in the park? Dear Dolly, please do a show about unicorns." Emails are due here by April 15. Celine Dion this week released a weird video – but most things Celine does are rather odd :) – announcing her upcoming World Tour and she threw in a little Dolly. Watch the clip to the end here to see her belt out a little "Jolene." 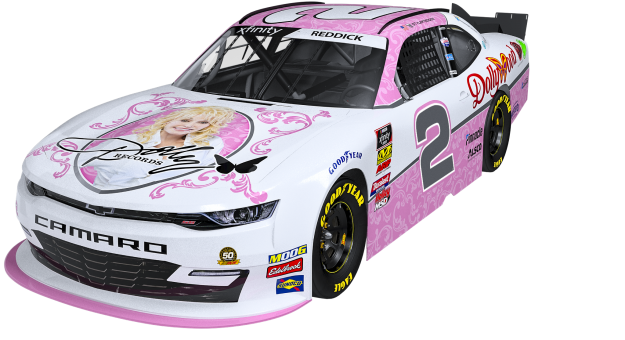 Richard Childress Racing on Wednesday announced Dolly's NASCAR debut with her very own vehicle to be raced this weekend. Tyler Reddick's No. 2 Chevrolet Camaro will be Dollyized for Saturday's Alsco 300 at Bristol Motor Speedway. Dolly's face graces the hood above her signature logo to represent "Dolly Records," while Dollywood logos are found on the rear quarter panels, her official website, DollyParton.com, is across the rear roof as well as DreamMore Resort and her Imagination Library charity on the back fascia, and Stampede, Splash Country and Pirates Voyage on the deck lid. "It's an honor to represent Dolly Parton and her variety of businesses on our No. 2 Chevrolet Camaro this weekend at Bristol Motor Speedway," Reddick said of the bright pink vehicle. "Dolly is an icon and has had a lot of success in her career, which is something I admire while trying to build my own success in NASCAR. Hopefully, we can take Dolly and the No. 2 Camaro to Victory Lane this weekend in her home state of Tennessee. I think that would be really special for everyone who is a fan of hers." Reddick is the 2018 Xfinity Series champion and enters the event in Thunder Valley with RCR as the current series leader. He is fresh off a second-place finish in last weekend's event at Texas Motor Speedway and will be competing in Xfinity Racing's Dash 4 Cash $100,000 bonus this weekend. The Facebook posting of the announcement is available here and the official press release is available here. The news quickly went viral throughout the day and was featured on several major news outlets. Dolly's Netflix Christmas musical Christmas On The Square is currently casting dancers age 8 and older with technical training to film in Atlanta. An open casting call will take place in Los Angeles on Saturday and Sunday, Backstage reported here. ABC's American Idol on Monday presented its top 20 artists, who performed solos for the panel of judges, and Riley Thompson went with a Dolly classic, "Jolene." Check out video of her performance here or in the media player above. Lively McCabe Entertainment, which recently inked a deal with Theatrical Rights Worldwide and BMG to develop theatrical musicals using previously-released songs, this week announced its first three projects, one of which be a stage musical featuring country music including Dolly. May We All will feature a book (script) written by Troy Britton Johnson and Todd Johnson and focus on disappearing small-town America as seen through the hopeful eyes of its youth when a fledgling country singer reluctantly comes home after a rough start in Nashville. Other artists whose music will be featured include Luke Bryan, Kenny Chesney, Faith Hill, Loretta Lynn, Tim McGraw and Florida Georgia Line. Read more from Deadline here. Dolly's theme park got a few national and regional media mentions Monday thanks to Pigeon Forge Guide's April Fools' Day joke here that Dollywood had been purchased by Kanye West. The park also got into the act with a video promoting Dream More Spa mud facials on location at the Wildwood Grove construction site using the site's own red clay mud, noting it is a limited-time offer until the new area's May 10 scheduled opening. Watch the video here or in the media player above. In related news, The Knoxville News-Sentinel promoted several coming attractions to the area, including Wildwood Grove, which it noted will have a recognizable voice providing rotating stories starting in June about the Wildwood Tree's origins, animals in the Smokies and the seasons. Read that here. The "gold series" re-issue of The Very Best Of Dolly Parton (Australian Tour Edition) loses three to No. 13 in its 393rd chart week on the Australian country albums chart since its original 2007 release, it was revealed Sunday. For the archive of monthly news stories, click here. Copyright © 1998-2019 T. Duane Gordon/www.dollymania.net. All rights reserved. "Dollymania: The Online Dolly Parton Newsmagazine. Your premier resource for Dolly Parton news and information." These pages are not affiliated with Dolly Parton, Dolly Parton Enterprises or Dollywood. Original text and images are copyrighted by Duane Gordon/www.dollymania.net or by their respective owners and published here with permission. These may not be reproduced without prior written consent.